Minerals and rocks have chemical compositions that comprise some of the most important data for phase equilibria studies. Important relationships among rocks and minerals can be discovered or demonstrated by the construction of composition diagrams (also called chemographic diagrams) to display the data. The system Fe-O. Figure from D. Perkins. Two-component chemical systems can be plotted as compositions on a line. Three-component systems can be plotted on triangular diagrams. Traditionally, the ends of the line (or the corners of the triangle) are the components being considered, and dots show where different compositions plot. For example, we can plot phases in the system Fe-O on a line. Then we can "pick off" possible reactions. Any two phases (for example wustite and hematite) can react to make one that plots between them (in this case, magnetite). The system CaO-Al2O3-SiO2 with some phase compositions plotted. Figure from D. Perkins. 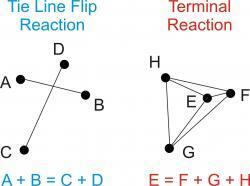 Two kinds of reactions can be "picked off" a triangular diagram: tie line flip reactions and terminal reactions, depending on the relative positions where the minerals plot. Figure from D. Perkins. 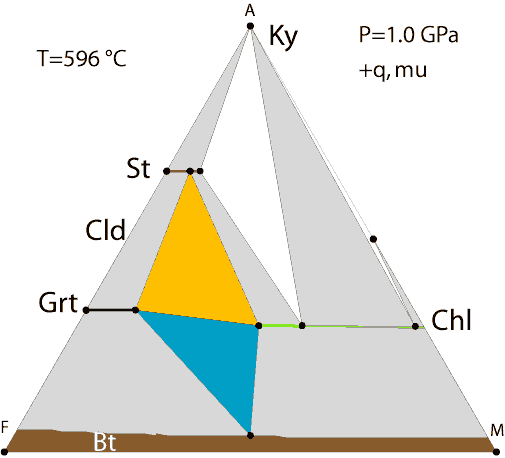 Three-component systems can be plotted on triangular diagrams with the corners representing the components (left figure). 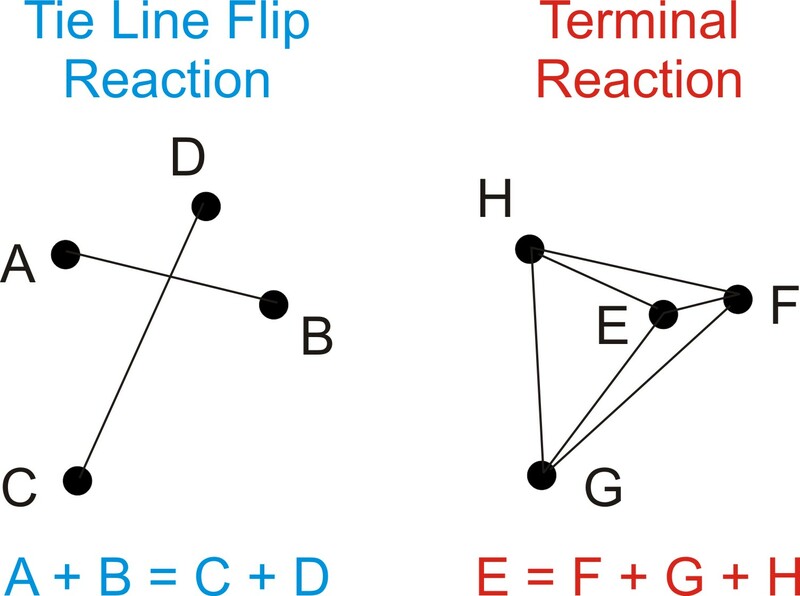 Mass balance considerations allow us to predict the type of univariant reaction that is possible (right figure): either a "tie line flip" such that A + B = C + D or a "terminal" reaction where one phase (E) breaks down to three other phases (F, G, and H). No other geometric arrangement of phasses (dots) can yield a reaction. 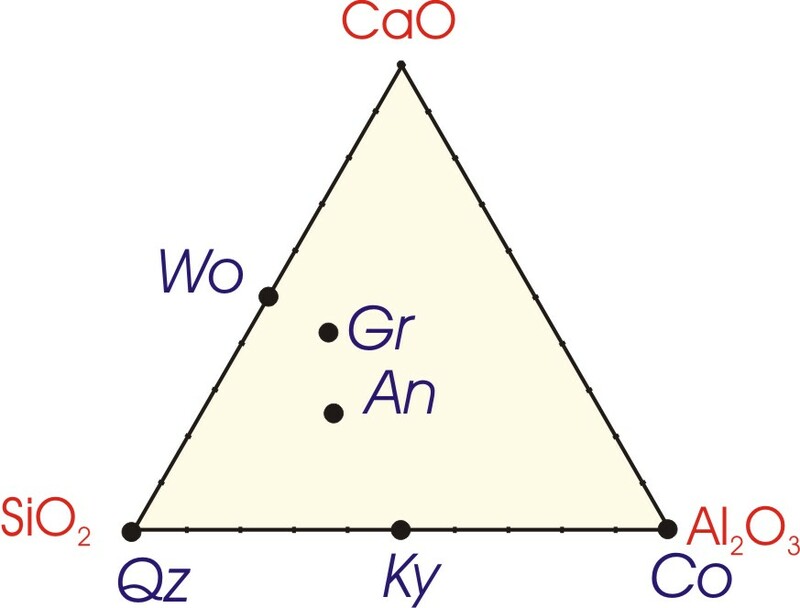 It is impossible, for example, for a reaction to occur such as Qz + Wo = Gr + An (which is neither a tie line flip or terminal reaction) because neither Qz nor Wo contain aluminum whereas both Gr and An are aluminous--to replace a non-aluminous mineral assemblage with an aluminous assemblage would violate the laws of conservation of mass! 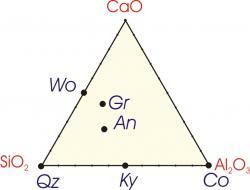 An = Gr + Ky + Qz, a terminal reaction. If a system has more than three components, it cannot be plotted in two dimensions. Sometimes petrologists create 3-dimensional diagrams to show a four component system, but such diagrams are frequently hard to visualize. AFM diagram with some common pelitic minerals plotted. Figure from D. Hirsch. Most of the time, petrologists prefer to find some way to reduce the number of components to three so that triangular diagrams may be used. A number of approaches are used, all of which produce chemographic projections -- projections of many components onto 2-dimensional diagrams. A typical metamorphic rock may have 8 or more important components. The trick is to find a way to project 8 (or more) compositional space onto a piece of paper and still have something meaningful. Different purposes and different chemical systems require different kinds of projections. Commonly used chemographic projections include ACF, AKF, and AFM (example shown here) diagrams. For details about these and other ways to project mineral compositions, see standard text or some of the references listed below. 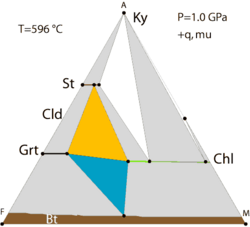 Also, highly recommended is Steve Nelson's Triangular Plots in Metamorphic Petrology. For some purposes, graphing composition data is more meaningful if components are changed. Often, interpretation is facilitated by transforming the chemical components of the mineral or rock analysis (generally oxides of the elements) to new chemical components that are either plotting coordinates (the corners of the diagram) or the compositions of projection (or ignored) phases. This page provides links to several spreadsheet templates that can help with the plotting of data on chemographic projections. A two component example is provided here for demonstration and to show some of the unusual consequences of component selection for the system Fe-O. Controls on Mineral Assemblages Lab (Microsoft Word 32kB Mar29 07) - This one week exercise, provided by Dave Pattison at the University of Calgary, includes problems sets involving Schreinemakers' analysis, bulk compositions and mineral assemblages. Metapelites Lab (Acrobat (PDF) 160kB Mar29 07) - This one week exercise, provided by Dave Pattison at the University of Calgary, includes problems sets involving petrogenetic grids, AFM diagrams, bulk compositions, mineral assemblages and isograds, as well as the use of program Gibbs.